This pattern is so much fun! Nothing beats a giggle for a sneezy, runny nose during the holiday season! 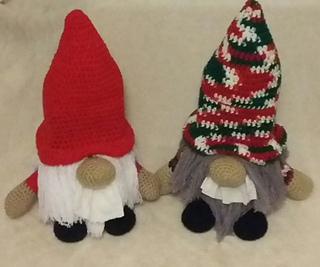 By simply changing the colors, you can use your Gnome Tissue Cover year round! 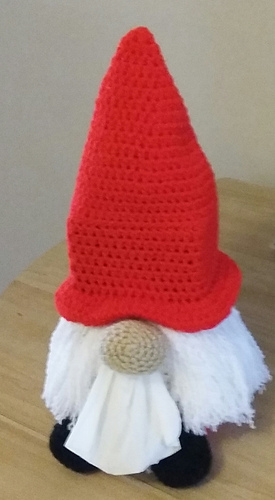 This pattern is written in English and uses US Standard crochet terms. It is an intermediate level pattern and is worked in rounds and rows.There are plenty of photos to assist you. It provides you with two options to adapt the pattern to the tissue box you many have on hand. 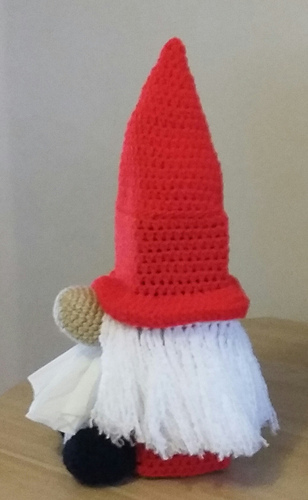 You will need to use a tissue box with a minimum height of 2.75” so your Gnome is not tippy. This pattern has been tested. You are free to sell the finished products! 150g/250 yds (or less) of Red & White, and small amounts of Skin Color & Black. OR Other box for which you can adjust your hook size to meet the stitch counts of either Option A or B.